The last few weeks have seen territorial losses for the Free Syrian Army (FSA), as government forces have executed a series major offensives on rebel-held areas. 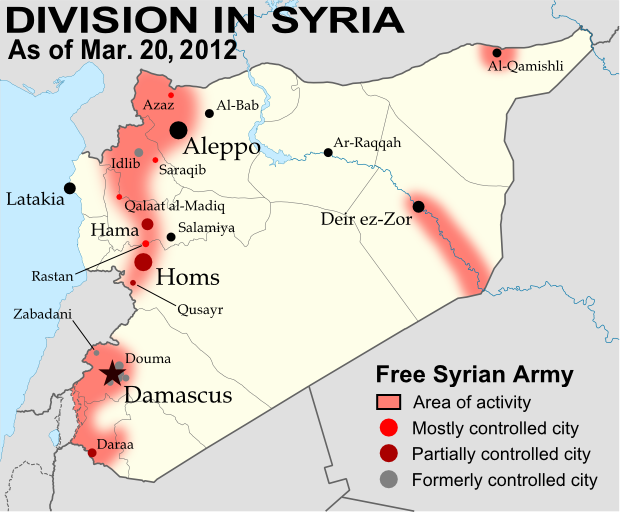 By the end of February, Qusayr near Homs was already reportedly only under partial control of the FSA, and on March 1 the Syrian army overran the rebel stronghold district of Baba Amr in the city of Homs itself. While fighting continues in a few other districts, the capture of Baba Amr was widely seen as crucial defeat for the FSA in Homs. Less than two weeks later, government forces successfully took the northern city of Idlib from the rebels after a three-day battle. Daraa in the south and Deir ez-Zor in the east have also seen government offensives, while shelling continues in Rastan and rebel-held areas of Hama, though territorial control of these areas has mostly not changed. Meanwhile, since our last update, significant FSA activity has been reported for apparently the first time in the areas around Aleppo and Al-Qamishli, both cities that have been relatively quiet up until now. This map also contains a correction from the last report - the town of Zabadani near Damascus was held by the rebels through late January and early February, but was taken back by the Syrian army prior to the last map update on February 26. That map has now been updated as well. Finally, the meaning of red coloration for cities on the map has been adjusted to include cities mostly under rebel control, since it is often difficult to determine whether control is 100% complete. You can see Political Geography Now's original report and background information on the Syrian uprising in the article entitled Syria Divided by Armed Conflict. Since this map was first posted, it has since been reported that Azaz and Qalaat al-Madiq were already under rebel control on March 20. The map has been revised to show this.